The Turkic mostly Muslim Uighur minority in China’s Xinjiang region face arbitrary detentions, daily restrictions on religious practice and "forced political indoctrination" in a mass security crackdown, Human Rights Watch said on Monday. The United Nations human rights panel said in August that China is believed to be holding up to 1 million ethnic Uighurs in a secretive system of "internment camps" in Xinjiang, in China's far west, where they undergo political education. Beijing has denied that such camps are for "political education" and says they are instead vocational training centres, part of government initiatives to bolster economic growth and social mobility in the region. China has said that Xinjiang faces a serious threat from Islamist militants and separatists who plot attacks and stir up tensions between Uighurs who call the region home and the ethnic Han Chinese majority. 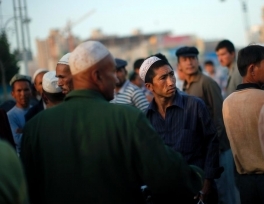 Uighurs and other Muslims held in the camps are forbidden from using Islamic greetings, must learn Mandarin Chinese and sing propaganda songs, according to a report by Human Rights Watch based on interviews with five former camp detainees. People in Xinjiang with relatives living abroad in one of 26 "sensitive countries", including Kazakhstan, Turkey and Indonesia, have been targeted by the authorities and are often held for several months, without any formal procedure, the group said. Punishments for refusing to follow instructions in the camp could mean being denied food, being forced to stand for 24 hours or even solitary confinement, it said. Security conditions in Xinjiang outside the camps had also intensified markedly and now bear "a striking resemblance to those inside", Hong Kong-based Human Rights Watch researcher Maya Wang said, based on interviews with 58 former Xinjiang residents now living abroad. Wang and her team only spoke with people who had left Xinjiang due to a lack of access to the region and to avoid endangering those still living there. New security measures described by interviewees include proliferating checkpoints that make use of facial recognition technology and sophisticated police monitoring systems, such as each house having a QR code that, when scanned, shows the authorities who the approved occupants are. Monitoring of Islamic religious practices, such as asking people how often they pray and the closure of mosques, as well as regular visits by party officials to rural parts of Xinjiang, mean that practicing Islam "has effectively been outlawed," Wang said.